One year after a trip to Jamaica, the Caribbean was calling me back. 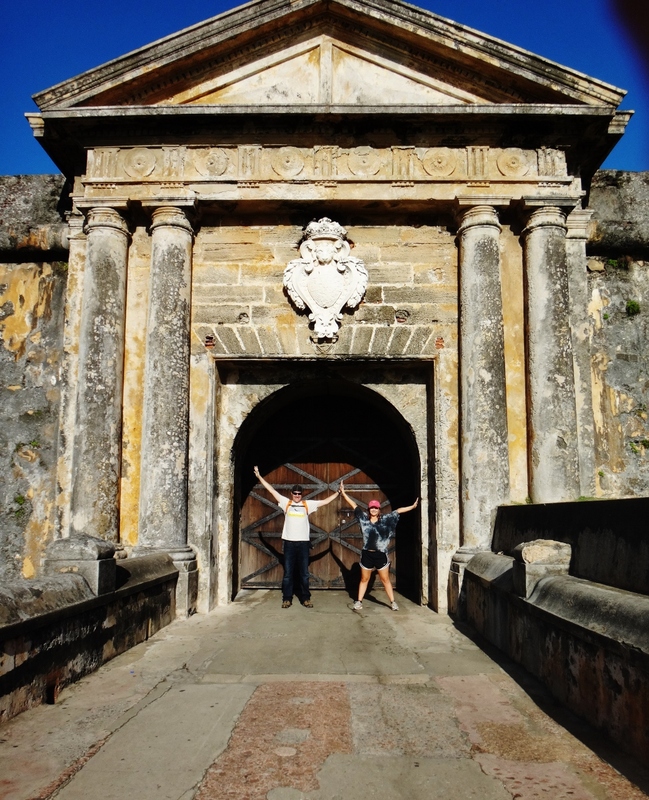 Brian and I packed our bags and headed to the southeastern edges of the Caribbean Sea to Puerto Rico – an island full local culture, historic sites, and exotic landscapes. 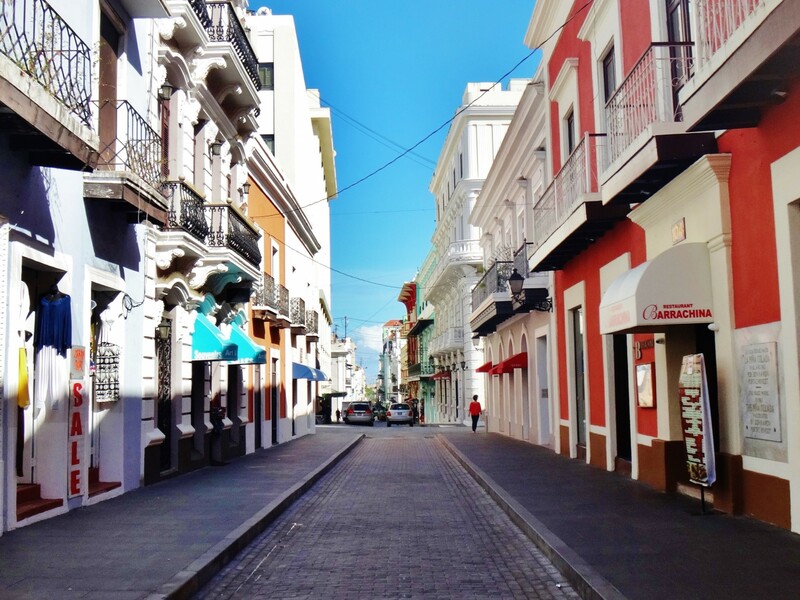 We based our stay in Old San Juan, the historic section of the island’s capital. 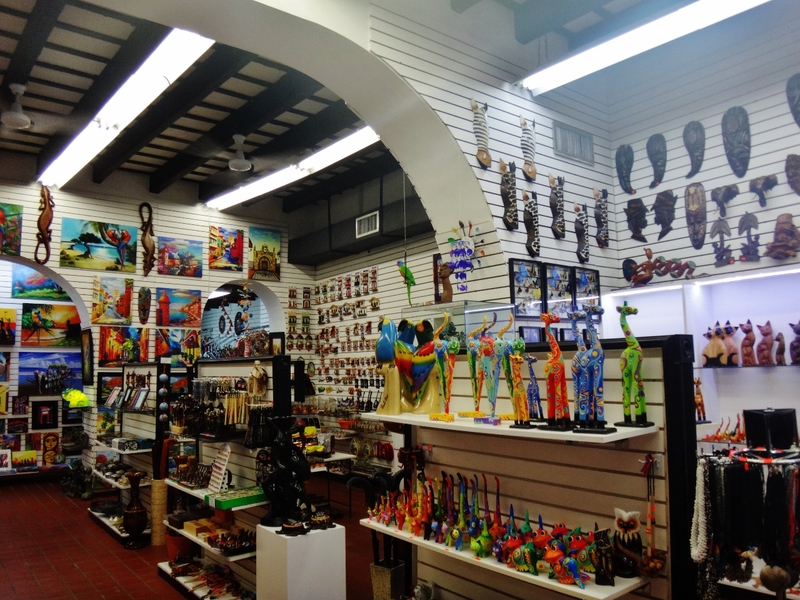 Old San Juan packs a serious amount of cultural flair into an eight by ten block area. There is literally something for everyone here; shopping, restaurants, bars and nightclubs, art, music, dancing, architecture, museums, historic sites, people watching, and scenic views. 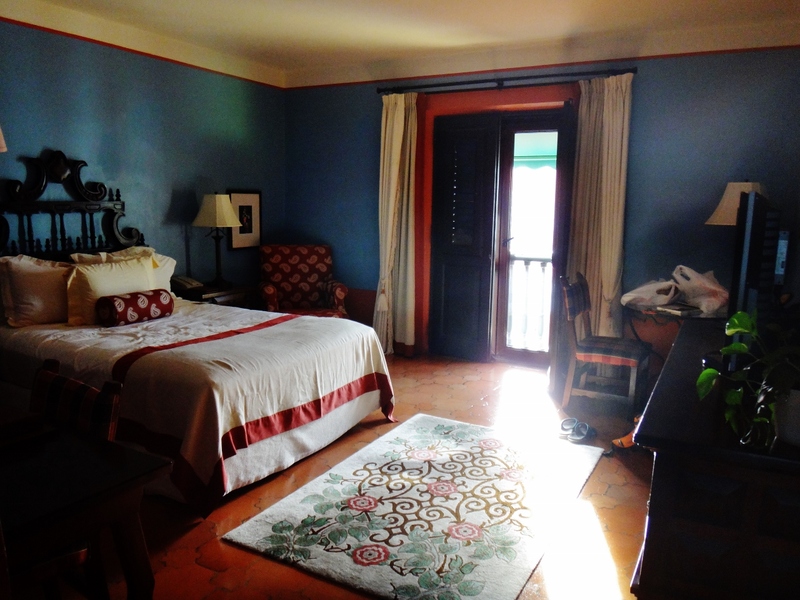 I booked our stay at the beautiful Hotel El Convento. 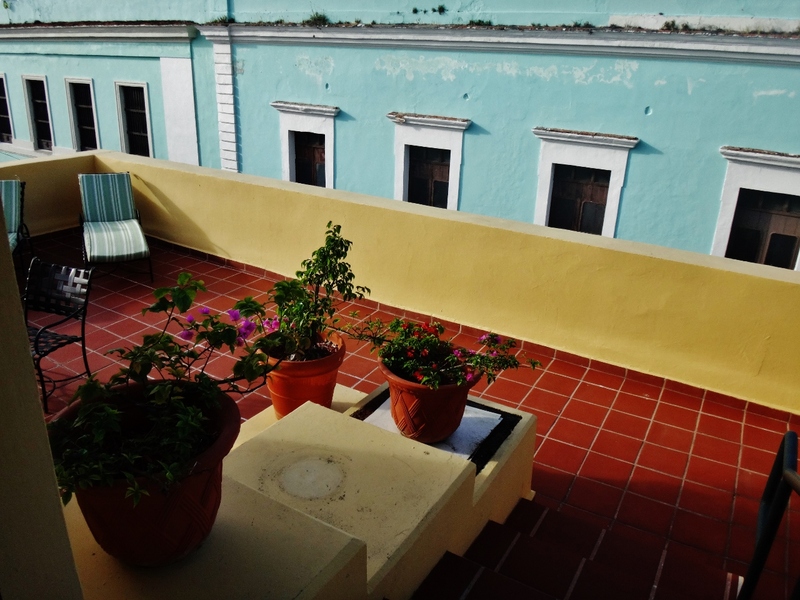 With over 2,000 reviews on TripAdvisor and the #3 rated hotel in all of San Juan, El Convento did not disappoint. When choosing the perfect accommodations, I try and look for a boutique (non-chain/non-American owned) hotel. This allows me to submerse myself in the local culture and customs both day and night, and I usually find the hospitality to be top notch. I knew El Convento was the right choice even before arriving at the hotel; on the second leg of our flight from Miami to San Juan, a local family sitting behind us overheard our conversation with another couple. The family asked where each of would be staying. The couple sitting beside us was rooming up at Caribe Hilton Old San Juan, a very nice hotel, but no reaction of excitement from the local family. 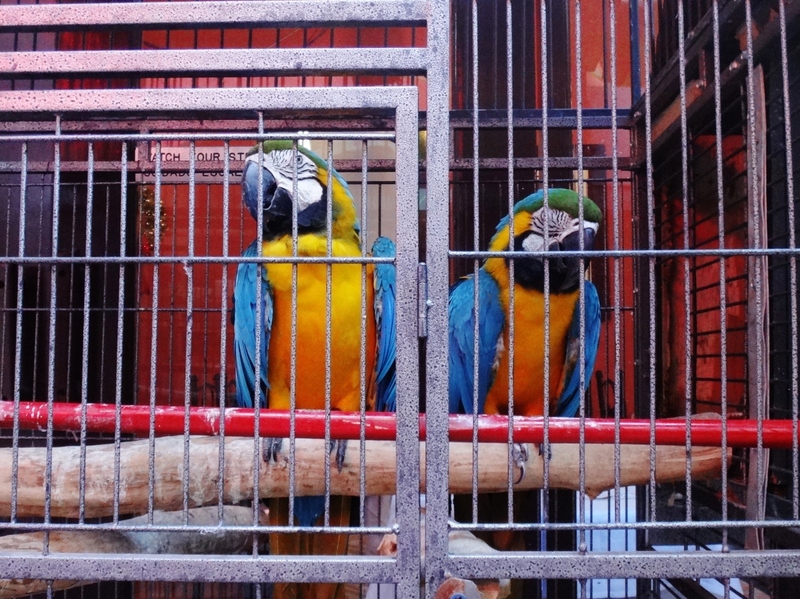 When we told them that we were staying at Hotel El Convento, an immediate large smile formed on each of their faces. They knew the hotel and were ecstatic that we picked a local favorite. 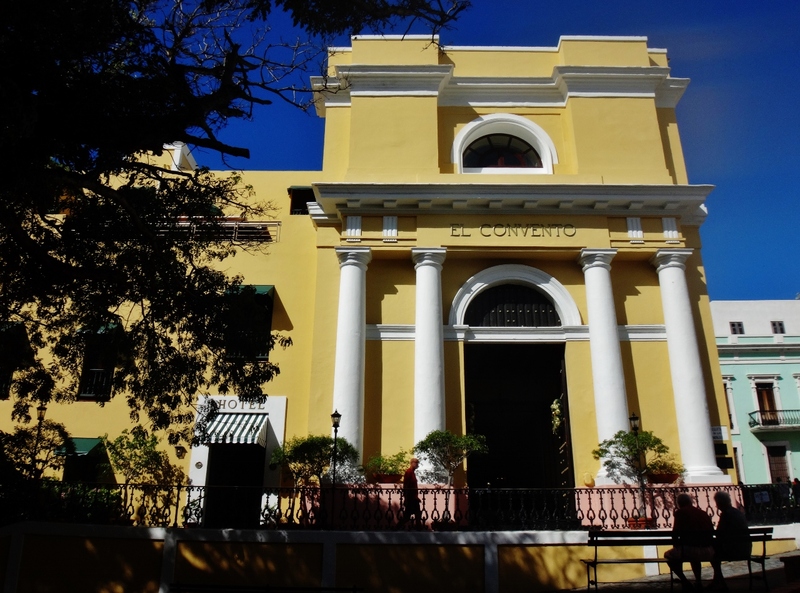 Hotel El Convento is situated in the heart of Old San Juan, just a 10 minute walk from the famous fortress, Castillo San Felipe del Morro, and right across the small cobblestone street to the Catedral de San Juan. El Convento was built in 1646 as the Carmelite convent for nuns, through a petition by King Phillip IV of Spain, and has since been remolded into a luxury hotel. We checked in, expecting the standard city view room we that booked online, but to our surprise we were informed that we had received a free upgrade to a corner suite with the hotel’s only private balcony patio. 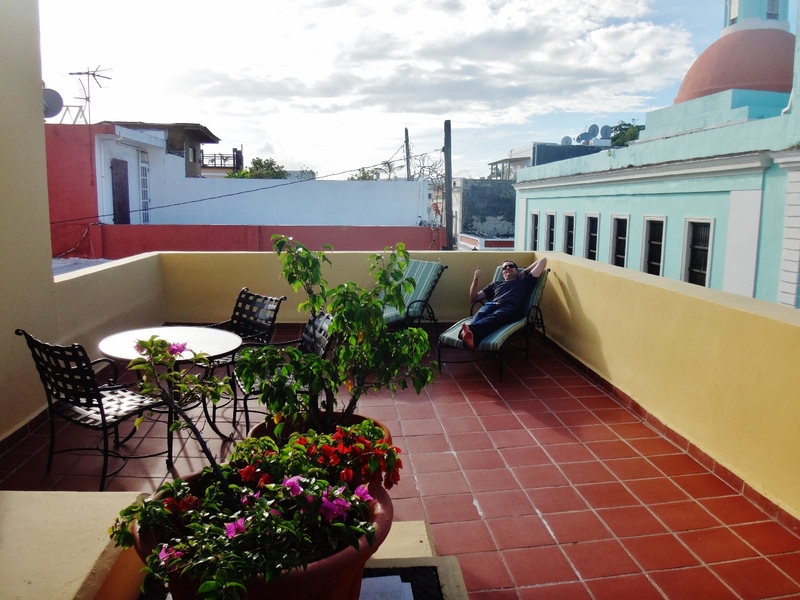 The room was immaculate – the interior beautifully decorated and the balcony was much larger than we expected with views of both the city and the bay – exactly the type of Puerto Rican style we were hoping for. 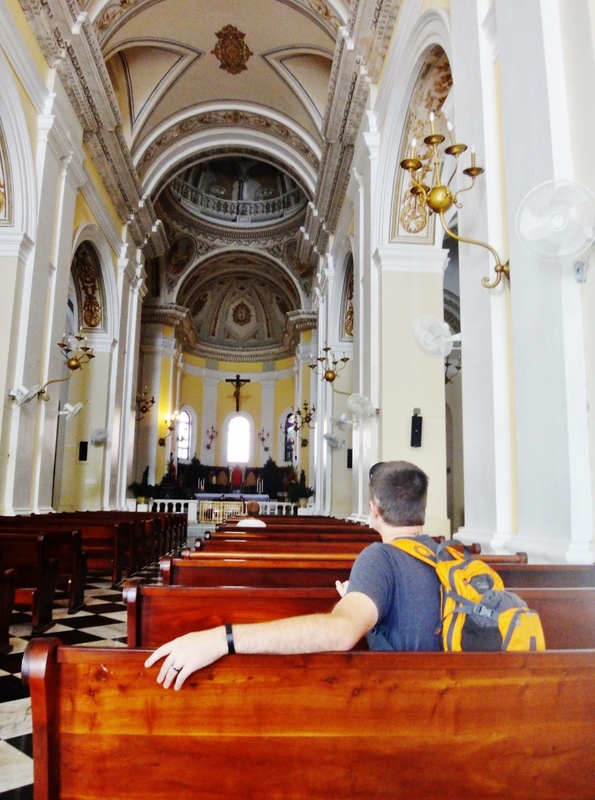 TRAVEL REVIEW: Hotel El Convento Trip Highlight! 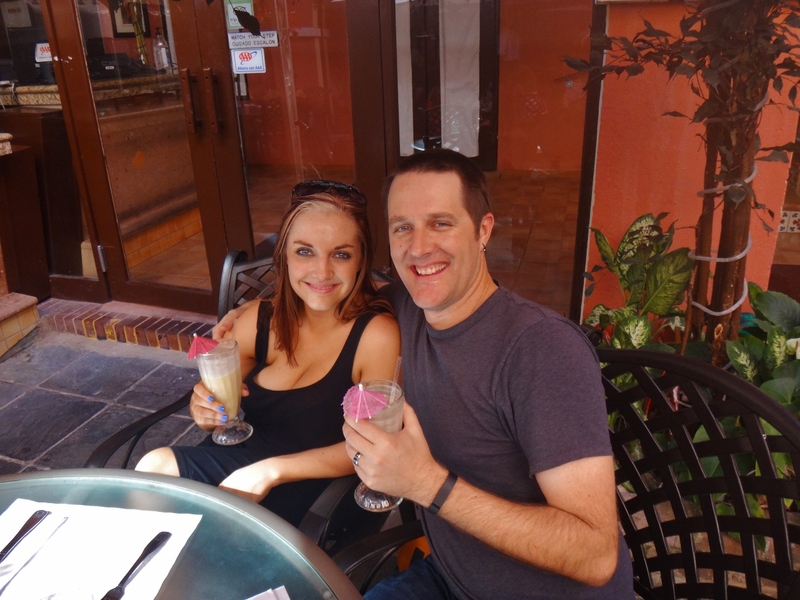 After dropping off our bags in the room and exploring the hotel grounds, we headed for Barrachina, the birth place of the Pina Colada, to fill our growling stomachs. After about 5 minutes of walking we turned down the cobblestoned Fortelzza Street where we could see the sign for Barrachina just up ahead. As we entered through the door we were welcomed with a cool breeze in the palm tree filled courtyard. We were seated under an umbrella covered table and immediately greeted by our server who asked if we were ready to try the “original pina colada.” Of course we were ready! Within a few minutes our server returned with pina coladas in hand. They were strong, refreshing, and tasty; just what we needed to kick start our vacation. After slurping down my first drink, I headed over to the corner of the courtyard to check out some colorful, talking friends. 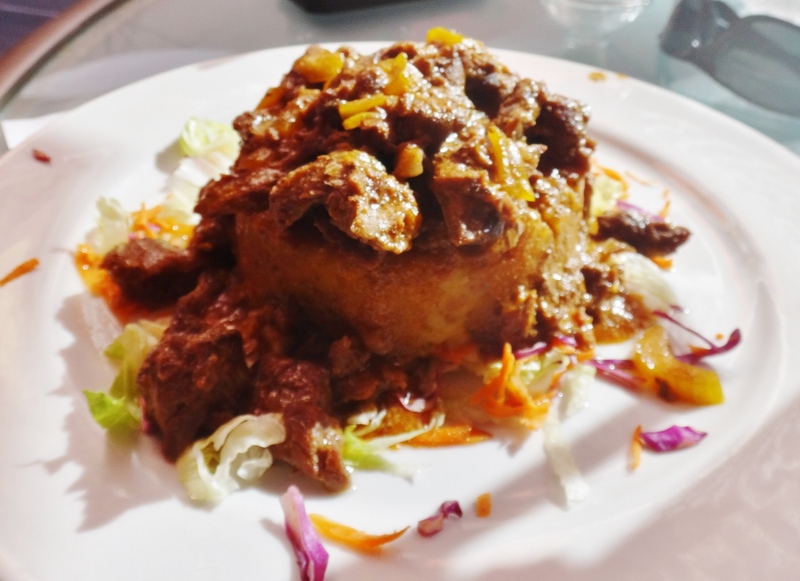 When in Puerto Rico you must try the local favorite dish, mofongo – mashed, fried, green plantains, seasoned with garlic and spices, and covered with your selection of protein (typically steak, chicken, or shrimp). We opted to split the steak mofongo and share a couple of appetizers. This was one of the best meals of our trip! 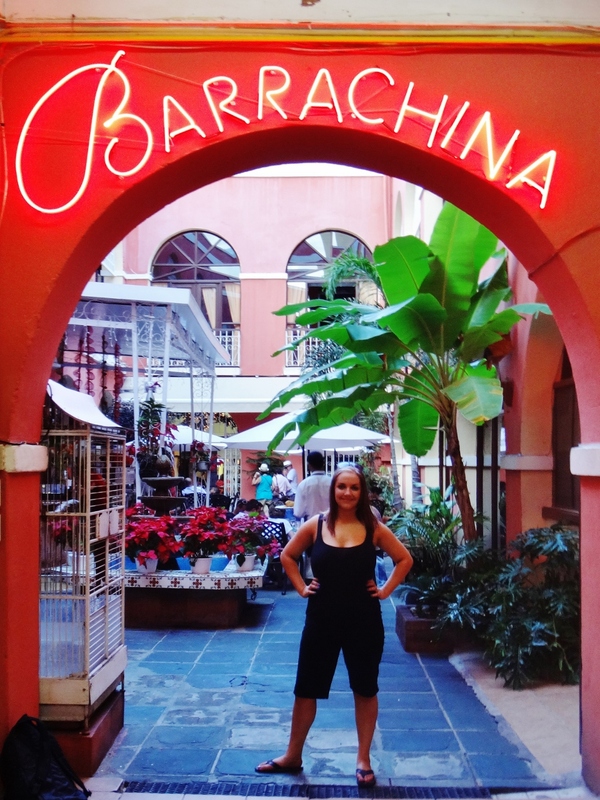 TRAVEL REVIEW: Barrachina Restaurant Must Do! After lunch we took a stroll through the colorful shop lined streets. 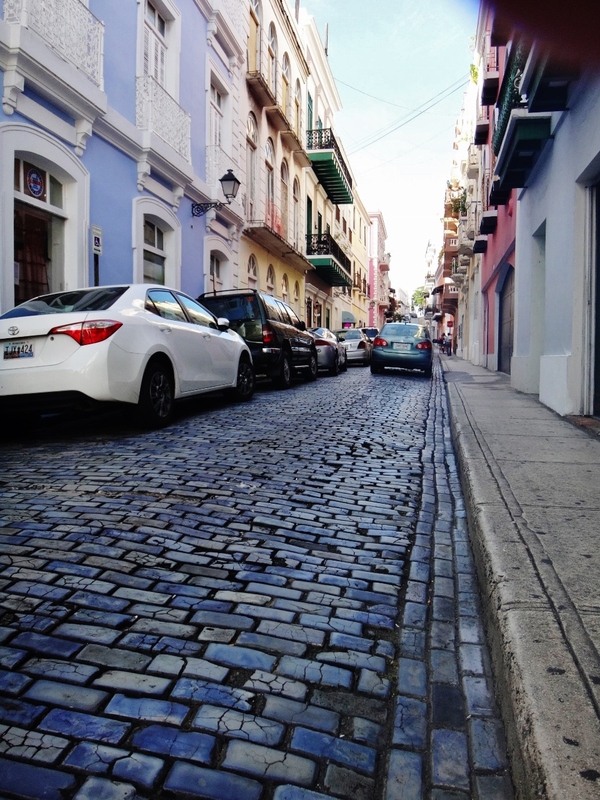 You will be doing a descent amount of walking in Old San Juan, and most of the streets are made with uneven cobblestone, so don’t forget a good pair of sneakers! For anyone who isn’t comfortable with a lot of walking, there are free trolleys available that will take you around the city. 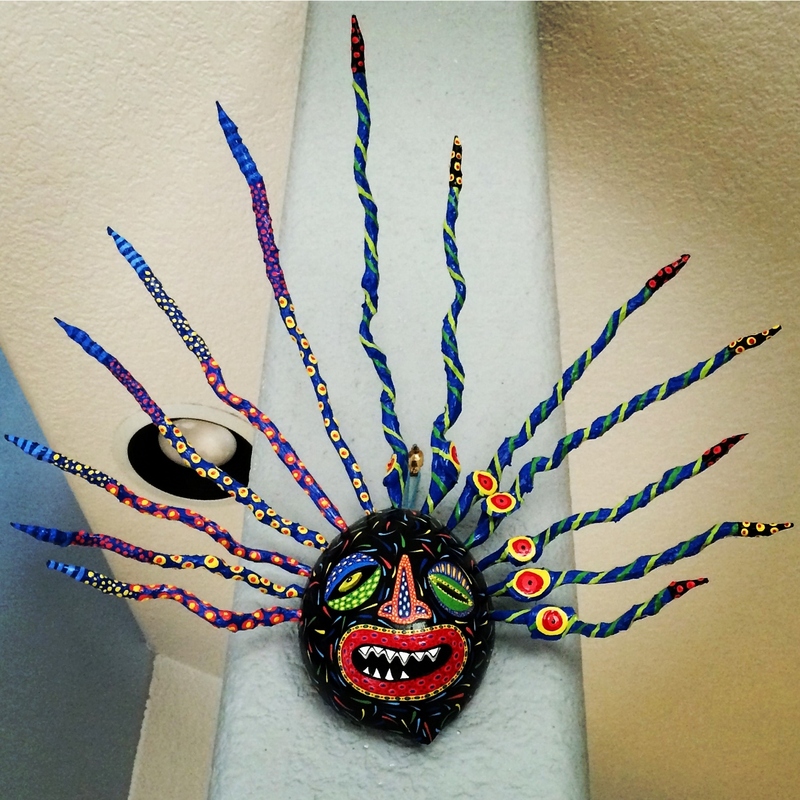 We stumbled into quite a few shops and picked up some souvenirs which included Three Kings ceramic artwork, chimichuri sauce, cigars, local coffee beans, and one of my prized possessions – a hand crafted vejigante mask. You’ll notice that a lot of the artwork in San Juan depicts the Three Kings. 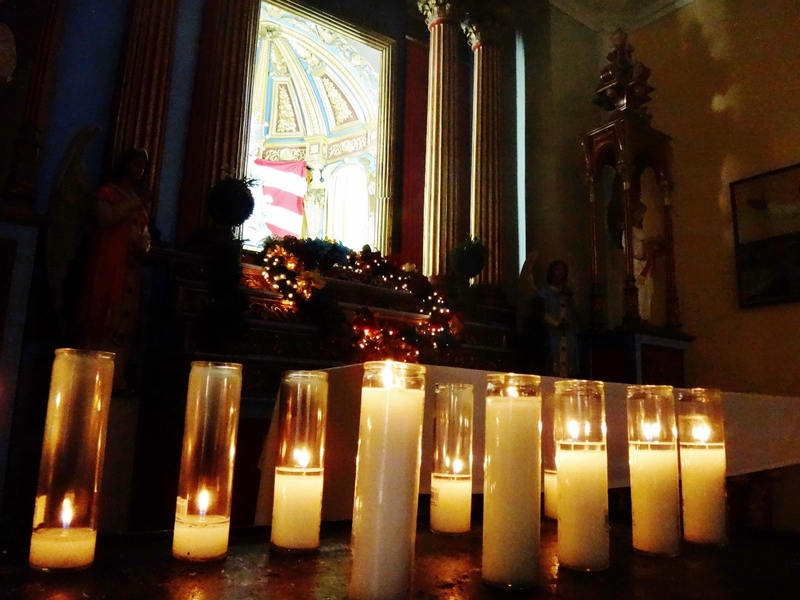 Three Kings Day is one of the most important holidays in Puerto Rico, celebrated each year on January 6th. The origins of the holiday stem from Christmas. On the night Christ was born, the Three Kings were drawn by a mysterious light which lead them to Bethlehem to honor Christ’s birth. The “12 Days of Christmas” begins on December 25th and runs through January 6, concluding with the Feast of Epiphany to celebrate the Three Kings. 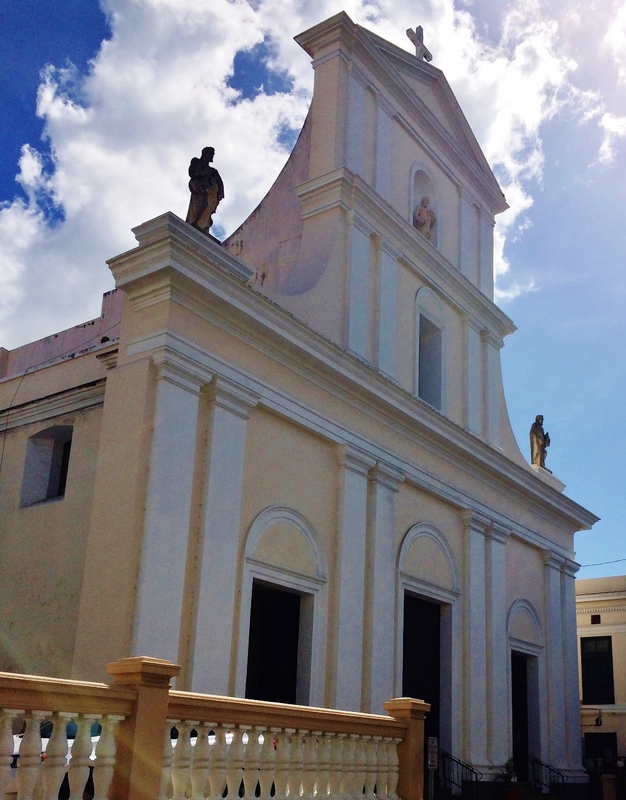 We made our way back to Hotel El Convento, but not before stopping in at the Catedral de San Juan, one of the oldest buildings in Puerto Rico. Built in 1521, it is the oldest church on U.S. soil and the second oldest in the western hemisphere. The church contains the tomb of Ponce de Leon, a Spanish explorer who was in search of the Fountain of Youth. Entrance to the church is free but they do accept donations. The church is still active and runs mass on Sundays. After taking a much needed nap, we wandered down to the second floor of the hotel where we heard they were serving complimentary wine and cheese. Every evening, before dinner time, El Convento has a reception on the Veranda Terrace where they provide a wide variety of wines and a fabulous selection of cheese, crackers and fruits. We grabbed a glass of wine and a plate of food and made our way out to the patio where we watched the sun set and the city transform from day to night. We woke up early the next morning to get an early start exploring Castillo San Felipe del Morro (El Morro). The fortress sits a the top of a high cliff overlooking the entrance to the San Juan Bay. 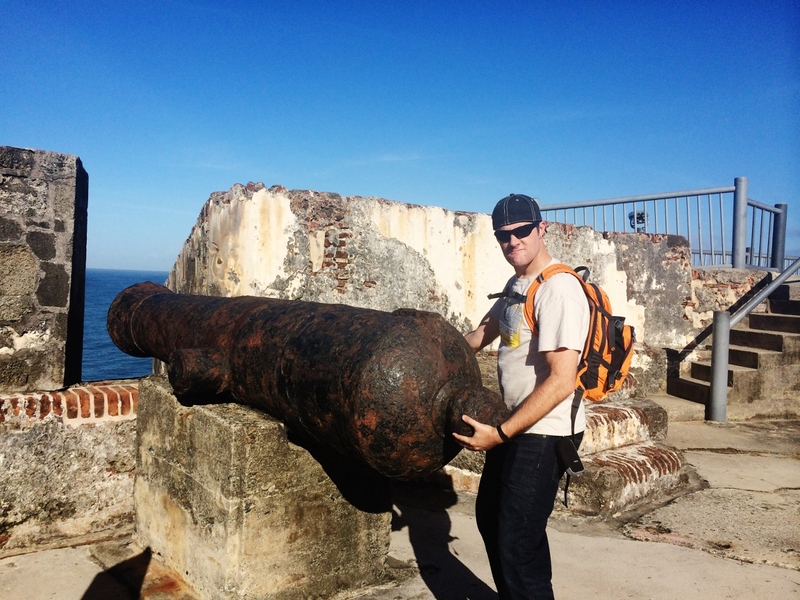 It took more than 250 years ton construct and is one of the largest forts built by the Spainish in the Caribbean. Construction began in 1539, but the six-level fortification was not complete until 1787. The United States Army used El Morro in World War II to to keep watch for German submarines. We had a lot of fun exploring all of the different levels of the fort. 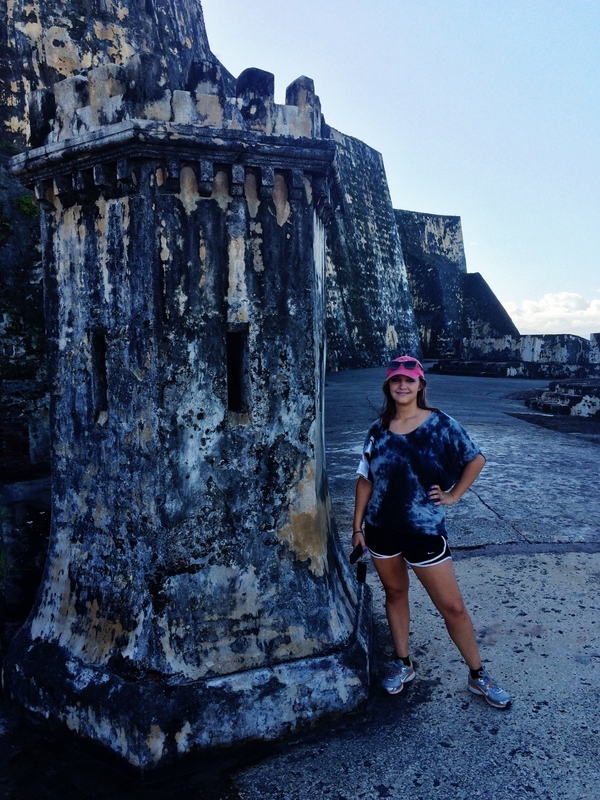 TRAVEL REVIEW: Castillo San Felilpe del Morro Trip Highlight! I would love to go back and explore Puerto Rico outside of Old San Juan. There is so much more that the island offers that we didn’t get to see in our short two-day stay. But, we had a ship to catch! We were about to embark on a 7 night voyage through the Southern Caribbean that took us to St. Thomas, St. Croix, Antigua, St. Lucia and Grenada.